Of course, I love trying new baking recipes especially when I get to play with nonstandard ingredients. And, I really love it when I get to try making treats that are sweetened with things other than refined sugar. I bake fewer sweet things than I used to, and I mostly avoid refined sugar except on special occasions. I’ve had some mixed results with this type of baking. A honey-sweetened carrot cake and some maple syrup-sweetened cookies that I baked were really far better on the first day than the second. And, a vegan, date-sweetened caramel I tried didn’t deliver the thrill of traditional caramel. So, I was cautiously excited to try the recipes in the new book Sweet Laurel by Laurel Gallucci and Claire Thomas of which I received a review copy. I wanted to love the flavors, and I really wanted the recipes to work well. After being diagnosed with Hashimoto’s disease, an autoimmune digestive disorder, Laurel Gallucci became committed to creating delicious baked good with no grains, gluten, dairy, or refined sugar. She and her friend Claire opened the bakery Sweet Laurel to showcase these creations. They offer “indulgent yet healthful” treats made with the simplest ingredients. No gums, fillers, or soy is used in the recipes. In fact, all the ingredient lists are surprisingly short. The chapters cover quick breads and breakfast treats, cookies and bars, pies and tarts, layer cakes, fillings and icings, and decorating techniques. I quickly zeroed in on the doughnuts with various glazes. They’re baked doughnuts made with almond flour, coconut oil, eggs, and maple syrup, and the glaze options include chocolate, strawberry, turmeric lemon, and coconut butter icing. Then, there are Classic Snickerdoodles, and the only reason I haven’t baked them yet is because I would eat every one of them. The Zesty Lime Pie and the Caramel Chocolate Banana Cream Pie are both strongly tempting me as well. Among the cakes, there are classics like the The Chocolate Cake That Changed Everything that inspired the friends to open the bakery and an old-school Pineapple Upside-Down Cake with pieces of blood orange standing in for the usual maraschino cherries. I couldn’t wait to get baking, and my first recipe from the book was the Alfajores that happen to be vegan as well as grain-free and free of refined sugar. There are three parts to this recipe, and each can be made in advance to make the final assembly a bit quicker. First, I made the Shredded Coconut “Powdered Sugar” topping. Rather than sifting actual powdered sugar over the cookies, these are topped with pulverized, unsweetened coconut that looks like powdered sugar. The coconut was blitzed in a food processor until fine. Next, I made the Vegan Caramel filling. I opted to puree the ingredients in a blender for the smoothest possible texture, but a food processor could also be used. Almond butter, maple syrup, coconut oil, dates, vanilla, and a pinch of salt were pureed until smooth. It seemed like a nice, thick mixture for filing the cookies, but next time I will take the suggestion of adding two more dates to make it a bit thicker. The cookies couldn’t have been easier. The dough was a quick mix of almond flour, a little salt, melted coconut oil, and maple syrup. That’s it. The dough was placed between two big sheets of parchment paper and was rolled out to about an eighth of an inch thickness. Small rounds were cut and baked. While cooling, the cookies were dusted with powdered coconut. Once cool, half of them were flipped and topped with vegan caramel before being sandwiched. Above, I mentioned some other lackluster, vegan caramel I had tried in the past. This was not that. This vegan caramel had all of the yummy factor I expect from caramel. I could have sat down with the bowl of it and a spoon. Next time, I will make it a little thicker so the cookies can withstand more filling without sliding apart. And, the deliciousness remained for these cookies the second day and the day after that. I can’t wait to bake more things from this book. Our favorite coffee shop is just blocks from where we grew up, and one of its featured treats is the alfajore, a melt-in-your-mouth Argentinian sandwich cookie. 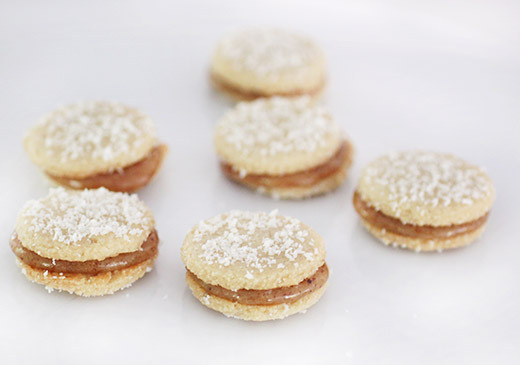 Traditionally made with shortbread, dulce de leche, and an abundance of powdered sugar, it’s the perfect cookie to pair with a cup of strong South American coffee. In our version, we switch out the dulce de leche for our vegan caramel, and coat the cookies in our coconut powdered sugar. Don’t forget to brew a pot of coffee! 2. In a medium bowl, whisk together the flour and salt. In a small bowl, combine the coconut oil and maple syrup. A little at a time, add the dry ingredients to the wet, stirring until a dough comes together. 3. Place the dough between two pieces of parchment paper and roll it about 1⁄8 inch thick. Remove the top piece of paper and, using a 1 1⁄2-inch round cookie cutter, cut the dough into circles and place on the prepared baking sheet. Bake for 7 to 9 minutes, until the edges begin turning golden brown. 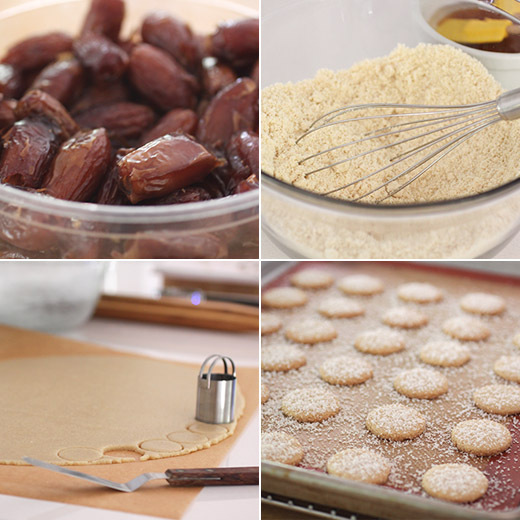 Transfer the cookies to a rack, dust heavily with “powdered sugar,” and cool completely while you prepare the vegan caramel. 4. Gently spread 1 to 2 teaspoons of vegan caramel onto a cooled cookie, then sandwich together with another cookie. Repeat with the remaining cookies and serve. Store in a sealed container at room temperature for up to 5 days, or in the freezer indefinitely. 1. Place all of the ingredients in a blender or food processor and puree until smooth. 2. Transfer the caramel to a glass jar and place in the refrigerator to chill. The caramel will stiffen up in the refrigerator, so if your recipe calls for it to be spreadable, let the caramel sit at room temperature for 30 minutes to an hour, and give it a good stir before using. The caramel will keep for about 1 month, refrigerated. 1. In a food processor, blend the coconut and arrowroot until a fine powder forms. 2. Sift the mixture over the doughnuts, generously dusting each, then serve. Love that date syrup! These cookies look amazing, Lisa. oooh, i'm going to have to use that pulverized coconut topping on something, and soon! The cookies look and sound like they would melt in your mouth. 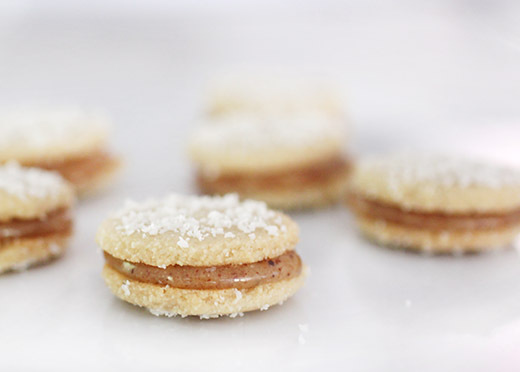 I love alfajores to begin with, but these look especially delicate and delicious. I love the idea of using almond flour, too. It adds such a nice soft, moist texture to everything.